This single was released on December 5, 2007, and did not chart inside the top twenty on the Oricon Chart. The song is the main theme to the redone Final Fantasy IV for the Nintendo DS. “tsuki no akari -Final Fantasy IV Theme-” is a very soft ballad that is piano based, with soft strings for emphasis and a beautiful flute solo at times. This song is good J-pop, but the strength lies in the excellent composition, which is emotive and evokes memories of the game FFIV. The song may not be perfect, and the vocals may be very soft, but it allows the music and melody to stand front and center, where they should. The song ends as softly as started, but that’s not a problem. Many will find this ballad on the weaker side, but viewed as a tie-in, it’s excellent. 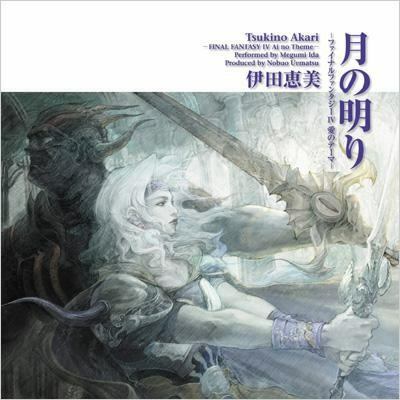 “ai no theme DS” is the instrumental version of the song featured in the FFIV game. It’s better than the next track, “ai no theme SFC,” which is the theme from the Super Famicom Console, also known as Super Nintendo or SNES. Still, this single’s strength lies in the lead track and its instrumental; one need look no further than the karaoke of the lead track, which is very strong. Over all, great composition from Nobou Uematsu. It’s nice to see a theme so many years old given new life in modern J-pop, but still keeping the essence in tact. Although compared to J-pop, the song is only above average, the song is a must have if you are a Final Fantasy fan.